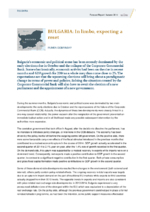 Bulgaria’s economic and political scene has been recently dominated by the early elections due in October and the collapse of the Corporate Commercial Bank. Somewhat ironically, economic activity had been on the rise in recent months and GDP growth for 2014 as a whole may thus come close to 2%. The expectations are that the upcoming elections will bring about a paradigmatic change in terms of power and policies. Solving the situation created by the Corporate Commercial Bank will also have to await the election of a new parliament and the appointment of a new government.